This week’s familiar face from season one is Toby Jones, making a triumphantly creepy return as David Pilcher, this time the agent of stealthy seduction for none other than Rebecca Yedlin to the fold of true believers. No, she’s not just the proprietress of Main Street’s best beauty salon, as we once wondered; she designed the whole damn place! Now we know why she’s not scared of Megan; she’s her peer, and arguably better trained and better able to realize the vision of Wayward Pines than a hypnotherapist (despite her zeal) could ever be. There’s a way of looking at the original group (whose members we probably still haven’t fully seen) as the Titans behind the First Generation of young Olympians. The Pilchers (Pam and David) were the parents, and both being dead, that still leaves Rebeccca, Megan and probably Mitchum in the Pantheon. They’re some of the few with power to influence Jason and Kerry, and Theo Yedlin and Xander may become pivotal as well. The flashbacks reveal how Pilcher played Rebecca, frustrated in her career ambitions, by offering her sole control of an impossible dream town. If there’s a disconnect, it’s that a visionary architect would be content with creating a world as mundane and 1950s suburban as Pilcher wanted, but apparently she was quickly on board. Until she realized the town wouldn’t be built for 2000 years and she’d spend that time in a frozen chamber. She seems to have tried to bolt at that point, but obviously she failed to escape Pilcher’s grasp. As did her husband, revived for medical reasons three years after she was awoken to (secretly) look after her artificial village. It’s interesting that even then, she and Theo had a passionate but brittle relationship, with him (though being engaged in her career) encouraging her to stay grounded and she resisting what she saw as his pessimism. The battle continues in the present day, with her compassion for Xander (married to her by decree before they decided to wake up Theo … another cruel mistake? Seems they were unable to conceive) giving Theo the worse homecoming ever. This after a day spent asserting himself with Kerry at the hospital and not quite realizing that homosexuality may be a capital crime in this tiny community so obsessed with procreation. 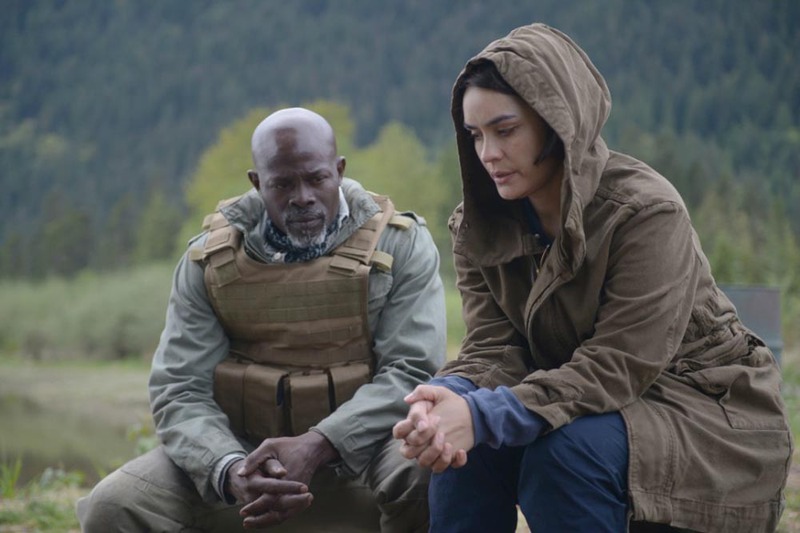 Yedlin’s icy rage is his best quality when coping with Wayward Pines, as he demands to be the leader of the examination of the female Abbie found last week. She’s their first ever and she seems passive and calm, too, unlike all males. Kerry approves of him contributing to the Abbie investigation, as Megan’s weaknesses abound and her allegiance to Pilcher’s every notion is growing more and more quaint and misguided. Meanwhile, outside the wall, Adam confesses he got Ethan (and thus Theresa and Ben) kidnapped by the program long ago, and thus signed himself up, too, even though (bad planning? Sabotage?) he was ultimately woken years before any of them and charged immediately with investigating the horrors of the outer world. He’s the only explorer to ever return, and he only did it for Theresa. Who hates him for destroying her family. Complicating all of this, the female Abbie has a placating effect on her fellow inmates in the lab, even in the face of Megan’s torture. She (dubbed Margaret by a lab worker) seems also to be able to telepathically lead the abbies beyond the wall. She seems to stop them from torching the new crops, but wait? Since when have they had fire? Wayward Pines 2.05 "Sound the Alarm"